Our fax server supports 32 fax modems out of the box, we do not charge additional licensing fees to support additional modems as some our competitors do. If you have caller id feature on your phone line and a modem that supports caller id, the caller id number reported will be used and override any CSID transmitted by the remote fax automatically. Our fax server uses regular fax modems, you do not need a high priced dedicated fax board like Brooktrout to send and receive faxes with our fax server software. Our SG3 edition can transmit and receive faxes at speeds up to 33,600 bps when communicating with other Super G3 fax devices (Class 2.1 fax modem required). Since most modern fax machines are Super G3 capable, you will realize much greater fax throughput with this small incremental investment. Fax printing is configured on a per-modem basis. You can direct printing to different printers for each modem. Printing when fax received is not required, you can save paper and print at a later time only when needed. Multi-page fax images can be split and saved into individual files automatically, ideal for integrating multi-page faxes into individual patient profiles in medical record systems. Fax images are always saved internally to the fax server's database. Configuration options allow fax images to additionally be saved to a location of your choice in either .tif or .pdf format. Unwanted "junk" faxes can be filtered and rejected based on user defined criteria. Incoming faxes can be automatically forwarded to any number of email addresses in either .tif or .pdf format. Incoming faxes can be automatically forwarded to other fax machines. 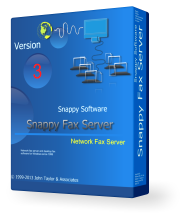 Faxes are originated in the client software and submitted to the fax server for transmission. When the fax is sent, the user is notified. Faxes can be submitted to the fax server to be transmitted immediately or scheduled to be sent at a specific date and time. Our fax server works with all versions of Windows Server or on small peer-to-peer networks where Windows server is not used. In Windows Server environments, the Fax Server "Role" is not required to be installed. There is no limit to the number of clients that can be supported by the fax server, you can add support for additional workstations as your network grows. Network clients can be assigned priorites, higher priority client's faxes are processed first. Workstation clients can be granted permissions to send faxes, view incoming faxes, check out/check in faxes, etc. on a per modem basis, effectively isolating clients to specific fax lines if needed. Check Out/Check In feature in server/client helps ensure no incoming fax is processed by more than one staff member. If a fax is checked out by one client, other clients will be denied access to that item until it is checked back in by the client. No per-modem or per-fax line charges. Volume discounts are available for larger networks, cost per workstation can be as low as $39.00 making our fax server the most affordable, full-featured fax server around. Many foreign languages are currently supported. The full version is free to use for 30 days, these are not "demo" or "trial" versions, if you need additional time to evaluate our software further, contact our sales team. One or more fax modems connected to your telephone line is required to send and receive faxes.